An orderly workbench isn't only easier on the eyes, but it also helps you work faster because you're not wasting time looking for tools that are buried somewhere. This sturdy multi-tool rack, with room enough to hold up to 6 items, is the solution you need: made from durable steel that won't bend easily, it hangs on a standard pegboard in seconds, and allows you to start organizing your tools instantly. The PBR-001 Wood Rack storage system will help bring order to your workshop, garage, shed, or storage area. It can also be used for off season storage of recreational items and yard tools. Easy to install and customize; great for shop/garage walls, basements, sheds and even outdoor fences. It provides 6 levels of storage with a 110 pound-capacity per level. You can install the Wood Rack on most stable, upright surfaces including drywall, brick/block wall, steel wall, shed or wood fence. 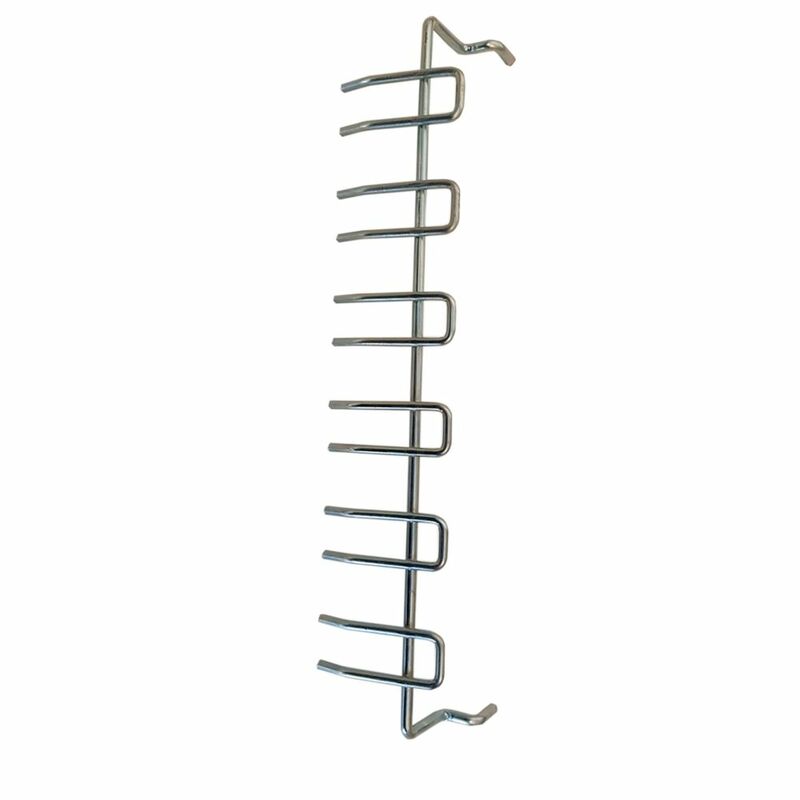 The package includes 2 vertical bars, 12 horizontal bars and 6 spacers (plus screws). The PBR-001's vertical bars measure 41 inches high, while the horizontal bars have a shelf depth of 12.25 inches. This beautiful church chair offers an advantage over pew seating with the flexibility of creating different seating configurations. The chair's cushioned back and 4 inch thick seat are generously padded with CA117 fire retardant foam and covered in durable fabric upholstery. The spacious, 21 inch wide seat has a waterfall edge that reduces pressure on your attendees' legs. A convenient book pouch on the back of the chair keeps seminar materials, bibles or hymn books readily available and a book rack under the seat gives everyone a place to store their personal belongings. Built-in ganging brackets connect your chairs and maintain nice, straight rows. Its sturdy 16 gauge steel with gracefully angled legs, has been tested to hold up to 800 pounds and plastic rocker glides protect your floor by sliding smoothly when you need to move the chair. This Church Chair is an excellent option for hotel lobbies, banquet halls, conference facilities and worship centres. Frost 2080 bike racks are designed in Canada to provide both a rugged and modern bike storage solution. This rack should hold up to 5 bikes comfortably. Units can be placed side by side for additional capacity. All steel construction, 3" x 3/8" HRS plate. RAL super durable TGIC-free polyester powder coating provides rust proof finish. Holes provided for anchor mounting. Tested to survive harsh summer and winter weather. Frost 2090 bike racks are designed in Canada to provide both a rugged and modern bike storage solution. This rack should hold up to 6 bikes comfortably. Units can be placed side by side for additional capacity. All steel welded construction in heavy duty 11 & 12 gauge HRS. RAL super durable TGIC-free polyester powder coating provides rust proof finish. Tested to survive harsh summer and winter weather. Holes provided for anchor mounting. Pegboard Multi-Tool Rack for 6 Tools An orderly workbench isn't only easier on the eyes, but it also helps you work faster because you're not wasting time looking for tools that are buried somewhere. This sturdy multi-tool rack, with room enough to hold up to 6 items, is the solution you need: made from durable steel that won't bend easily, it hangs on a standard pegboard in seconds, and allows you to start organizing your tools instantly.